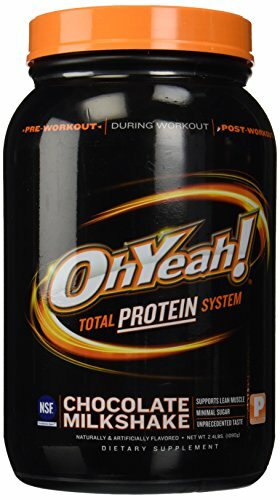 In this article I’ll be doing a review of the protein shakes (RTD), protein bars and protein powder from OhYeah!. Before I get started, I wanted to clarify that the protein shakes are the ready to drink shakes that you can buy in the stores where you just grab it and chug. This is different from the powder because the powder you have to mix yourself. The main difference here will be the taste. Enough of the intro, let’s get into the good stuff. I’ll kick this off with my favorite of the three which is the ready to drink shake. The flat out best part of this is the taste of these. I’ve tried so many different protein shakes over many years and nothing I’ve tried really comes close to how good these taste. They have a few different flavors but the vanilla crème is best tasting, followed by the strawberry then the chocolate. I could drink the vanilla one everyday for the rest of my life and not complain but it would be cool to see OhYeah! to start looking into some less common flavors like a red velvet cake flavor for example. Aside from the flavor, it packs a solid amount of protein into each one at 32 grams of protein which is impressive considering the size of the bottle. Overall though, your going to have a very hard to finding a better tasting shake that packs this much protein into it as well. If you do then let me know because that is something I will surely have to try! The OhYeah! protein bars resemble the qualities of the RTD shake in that it taste absolutely amazing. I’m not sure who is in charge of their flavor creation team (is that a thing?) but they have some mad skills in doing what they do. Now the calories in the bar will match how good it tastes so don’t expect a 100 calorie bar with this taste/size/protein amount. I would say these types of protein bars are more meant for either a meal replacement or as a decent pre workout meal for someone snaking. Between a RTD shake a 1 of these bars you pretty much get about 90grams of protein just from that which you should easily be able to hit you protein macros from food alone after that. The protein powder is great for those who are needing more protein in their diet or possibly looking to save a little money if the RTD shakes are to pricey for you. The good thing about these is you can adjust your shakes according to what your diet plan is. Example: add an extra scoop if you didn’t get enough protein in during the day or maybe add in a scoop of peanut butter if you trying to add some more calories when bulking. The powder is the best tasting ones on the market in my opinion and while it doesn’t taste as great as the RTD shakes pretty much ever powder is like this versus the same brands RTD. There is multiple types of powders that OhYeah offers: Isolate, Mass, Total Protein and their new version, Whey Power. OhYeah is a brand that will get you hooked once you taste on of their products, so if you have the chance give them a try. Another great thing about this company is their products are NSF certified which I like seeing, just for peace of mind more than anything.